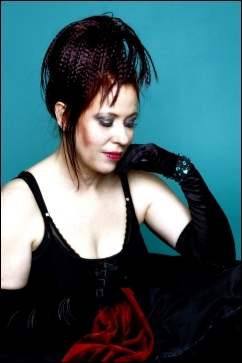 Hazel O'Connor is a British singer-songwriter and actress and daughter of a sailor from Galway. O'Connor originally became prominent as an actress in 1980 when playing the role of Kate in the critically acclaimed film Breaking Glass, and its accompanying soundtrack. Her performance as Kate won her the Variety Club of Great Britain Award for 'Best Film Actor' and BAFTA nominations for 'Best Newcomer' and 'Best Film Score.' The album of the same name went double platinum, reaching number 5 in the UK Albums Chart with a 28 week stay and produced several hit singles, the most successful being the haunting "Will You", and "Eighth Day". When O'Connor toured the UK in support of Breaking Glass the album, she selected as her opening act a then-unknown local group from Birmingham called Duran Duran. Subsequent albums for Hazel O'Connor include Sons and Lovers (which featured the hit single "D Days"), Cover Plus, Smile and Five in the Morning. Legal battles plagued O'Connor from the early 1980s - in her own words "I became famous, then had a load of court battles to fight against my first record company, I was ripped off, torn up and spat out by the machinery of 'Showbiz'"
The turn of the century saw O'Connor tell her life story in an autobiographical touring show entitled Beyond Breaking Glass, with harpist, Cormac De Barra. Hazel O'Connor currently divides her time between living in Ireland and France. Hazel O'Connor performing one night only in Mayo’s #1 Music Venue Magno’s Live on Thursday 23rd April. Doors open at 8pm. Tickets are on sale at The Music Mega Store, Market Sq, Castlebar (0949026299) @ €20.